Autumn, or Fall as this beautiful season is also known, is a time of change. The vibrant colours, creatures and sounds of Summer evolve into a more serene, although still beautiful surrounding, with leaves changing from the many versions of green through the yellows, reds and browns. The sun’s light changes and our body clocks are rewired. Traditionally this is the time of preparing all the food we would have harvested during the Summer and preserving it for winter. Watching the “change-of-season” in South Africa is very different to New Zealand, however similar people may think the two countries might be. Africa’s change, as with many things there, is more violent. More swift. It isn’t as noticeable as here in New Zealand. One moment you’re enjoying the gorgeous heat and thunderstorms of the Highveld Summer and next thing you know, the temperature plummets at night to around zero degrees. The grass turns a yellowy-brown in the sudden absence of rain and the frost leaves a glistening white crunchy layer on the ground each morning. The air is smoke-filled and grey from the occasionally burning, dry grass and it is astoundingly beautiful. Obviously areas around the coast experience their seasonal change differently, but a Highveld season change is striking. New Zealand is more laid-back. More graceful in it’s evolving beauty. I marvel each year how I get to enjoy watching the seasons change. New Zealand never loses it’s many shades of green, but the trees changing their leaves somehow seems more stately. It seems to last longer. The fruit trees especially share their splendour and with our recent Indian Summer and warmer than average Autumn temperatures, our plum tree is confused. Having lost it’s leaves and getting ready for the colder, wetter winter months, it has once again started putting out new leaves and tiny white blossoms. I won’t complain, I’ll enjoy it as long as Mother Nature allows me to. My neighbour has a few Feijoa trees in her yard. Very popular in New Zealand, this little green fruit is something I’d never seen nor heard of prior to moving here. I have to admit it isn’t one of my favourites and after 11 years here I still haven’t learned to enjoy the fruit on it’s own. I find it a slightly medicinal flavour with a strong smell which puts me off somewhat. But having been given two enormous bags of the fruit I set about baking and experimenting to see how I could make good use of this gift of Nature. People pay for bags of it in-store if they aren’t lucky enough to get their hands onto it freely and you know me, any time I get to experiment in my kitchen is time well spent. Feijoas, also known as Pineapple Guava or Guavasteen in other parts of the world, is native to the highlands of Southern Brazil, Eastern Paraguay, Uruguay, Northern Argentina and Colombia. So it’s not hard to understand how it came to be on the shores of New Zealand, possibly being brought across by sailors, birds or simply by the currents flowing between South America and New Zealand. We are neighbours after all, however distant. The fruit grows on an evergreen, perennial shrub or small tree. The fruit has a somewhat gritty texture which some might find off-putting, but it adds a little something different to any baking. You can also see the seeds in the baking, looking back at you like tiny poppy seeds. Their fruiting season is normally from around March to June, so a wonderful addition to the Autumn menu. I googled a few ideas and settled upon a recipe I found at foodinaminute.co.nz, but as is always the case with me, I didn’t follow it 100% So forgive me my minor changes please. 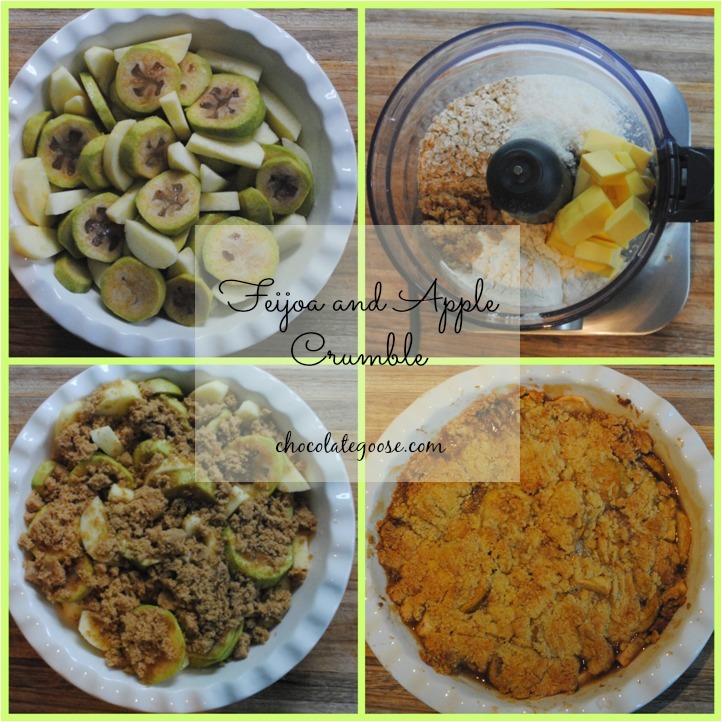 Prepare the crumble first by placing all ingredients into a food processor and blend or pulse until combined. Peel and slice the fruit. Place it into a baking dish and either pour over the Maple syrup or sprinkle over the sugar. Mix to combine. Top with the crumble mixture, spreading it out as evenly as possible to form a coating. Bake for 35- 40 minutes until the fruit is cooked and the crumble is crisp and golden. Serve with a dollop of freshly whipped cream, or in my husband’s case, a good helping of custard. The crumble mixture can be doubled and half can be frozen for use another day.